Manufacturer & Exporter of Stone Planter. Our product range also comprises of Marble Inlay Tiles And Borders, Temple Architect and Stone Bird Bath. 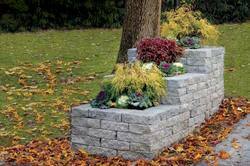 We hold expertise in offering a wide assortment of Stone Planter in the industry. These Stone Planters that we offer are made from pure stones and are available in various sizes and colours. These Stone Planters are highly used in parks and gardens are highly appreciated in the industry of it durable body and break resistant quality.